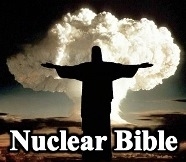 BIOTERRORBIBLE.COM: The Bio-Terror Bible is a free ebook (PDF) and website released on May 10, 2012, which was researched and written by David Chase Taylor of Truther.org. The Bio-Terror Bible ultimately connects the dots of an upcoming false-flag bio-terror attack and subsequent pandemic through the lens of over 1,000 data points of news, information and propaganda in the spectrum of bio-terrorism. Based on the cumulative data of bio-terror research, a made-for-tv bio-terror "event" will likely occur involving the use of agents known as Anthrax and Smallpox. However, the real pandemic that will kill of millions of people will the result of poisonous vaccines that will be issued to the public by the government and medical establishment in the aftermath of a major bio-terror attack. As people who took the first vaccines begin to die, the government will likely say that the virus has mutated and subsequently issue more vaccines that will kill even more Americans. Although the live pathogen or agent responsible for the coming pandemic will most likely be dispersed by the government and medical establishment via tainted vaccines, theoretically, pathogens, chemicals or agents could be dispersed via chemtrails by government airplanes and drones, by the U.S. Postal Service via Tide detergent samples, or by health clinics and stores via the portable petri dish commonly known as a "Trojan" condom. 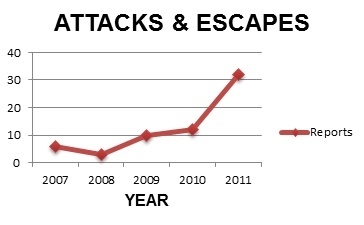 As evidenced, bio-terrorism is blinking red on every level. 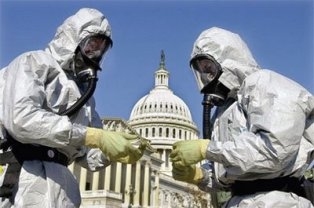 Aside from having the means, the motive and the opportunity to conduct a major bio-terror attack, the government is the only entity with the resources to organize, plan, drill and execute a major bio-terror false-flag operation. 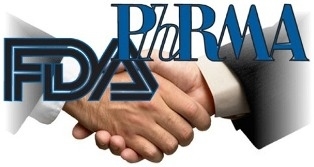 A major bioterror operation would cost millions if not hundreds of millions of dollars, all of which would be needed in order to blackmail scientists, steal or develop the virus or agent, weaponize it, deliver it and execute the operation without getting arrested or properly investigated. The sheer logistics, security, communication and cover-up needed before and after the bio-terror attack is so daunting, there is only one suspect (government) even capable of carrying it out. 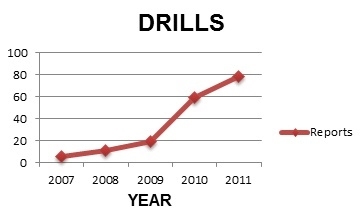 BIO-TERROR DRILLS: Since the election of Barack H. Obama in 2008, there have been over 175 bio-terror drills in America. The fact that these bio-terror drills exist in mass confirms that an upcoming bio-terror attack is in the cards and may be played in a last ditch effort to regain political, economic and militarial control of society. 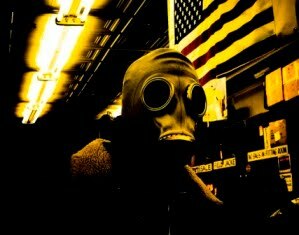 BIO-TERROR WAR-GAMES: To date, there have been 5 published bio-terror war-games which shed light on the possible future bio-terror attack scenarios. 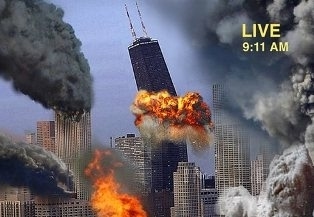 Based on these elaborate war-games, it can only be concluded that a bio-terror attack is the end game for America. 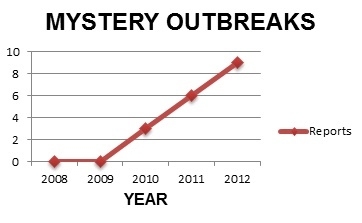 MYSTERY BIO-OUTBREAKS: Since the election of Barack H. Obama in 2008, there have been at least 19 "mystery disease" outbreaks in the world. While some of the mystery diseases may have been legitimate outbreaks, most if not all of them appear to be generated man-made outbreaks with the overall goal of convincing American and the world that it is on the precipice of a major pandemic. 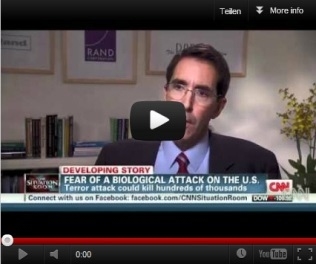 BIO-TERROR EVENTS: The NATO Summit Chicago on May 20-21, 2012 and the Summer Olympics on July 27-August 12, 2012 appear to be the chosen locations for a made for television bio-terror attack that will likely start a global pandemic that will cull millions. Other potential events where a bio-terror attacks could occur include the Occupy Wall St. Protests, the 2013 NCAA Final Four in Atlanta, Georgia, the 2014 Commonwealth Games in Glasgow, Poland and the 2014 World Cup in Brazil. BIO-TERROR PROPAGANDA: The overall goal of bio-terror propaganda is to convince America and the world that it is on the precipice of a bio-terror induced pandemic. Bio-terror propaganda is currently at an all-time high and confirms that an upcoming bio-terror attack is in the cards and may be played in a last ditch effort to regain political, economic and militarial control of society. 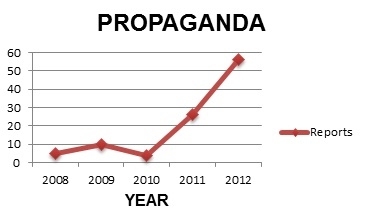 Propaganda also has little regard for the actual reality biological related sciences and is mostly fictitious in nature. 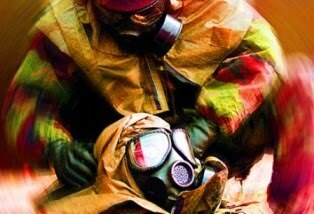 BIO-TERROR WARS: Despite the fact that the United States and its European Union allies have been researching, planning, war-gaming and drilling for a major bio-terror attack and the subsequent pandemic, the nation of Egypt, Iran, Iraq, Libya, North Korea and Syria have been quietly set up over the last decade as potential bio-terror scapegoats. 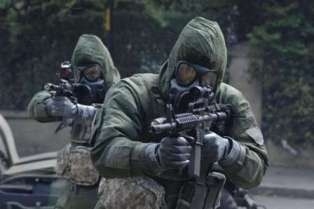 Based on the evidence available, it appears that the U.S., Israel and South Korea will be the future victims of major false-flag bio-terror attacks that will eventually turn in a full-blown biological wars. 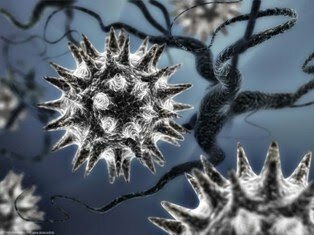 BIO-TERROR WEAPONS: There are currently a number of different biological weapons that have been developed for use against the civilian population, the most deadly of them being the vaccine. In the event of a bio-terror attack, the U.S. invented bio-terror grenade is an easy and undetectable way to unleash a pandemic with little or no accountability. 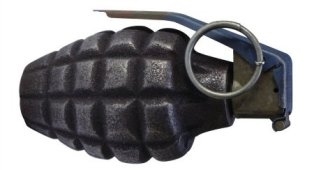 In the confusion of a riot or political demonstration, a government terrorist could easily roll or throw a bio-terror grenade into an unsuspecting crowd and start a chain reaction of infection which could ultimately affect the entire world. 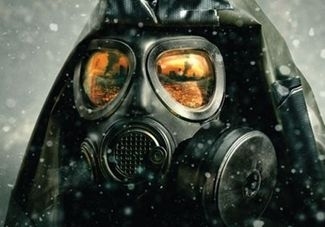 The blame for the ensuing pandemic would be placed on the political demonstration rather than the nation states capable of developing and using modern bio-terror weapons and techniques. 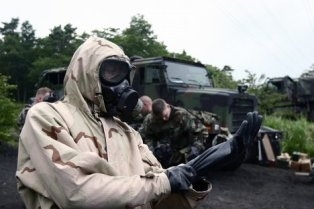 Other biological weapons developed by the United States and its European allies include genetically engineered bio-weapons, herbicidal bio-weapons, homosexual bio-weapons, non-lethal bio-weapons, offensive bio-weapons, race specific bio-weapons and Spanish Flu 2.0. 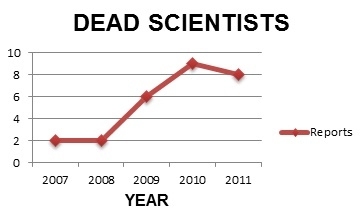 DEAD BIO-SCIENTISTS: Since May 19th, 1994, more than 100 scientists in the field of bio-terror, biology, genetics and medicine have been systematically targeted and assassinated. Most of these scientists died in horrible deaths resulting from car crashes, plane crashes, murder, suicides and poison. In almost every single case, the perpetrators of these crimes were never apprehended, let alone tried or convicted for the crimes that they committed. The war on biological scientists is a global phenomenon that continues until this day. BIO-TERROR SCAPEGOATS: In the aftermath of man-made bio-terror generated pandemic, the government and media will be feeding the public any number of different scapegoats in a desperate attempt to shift the blame and responsibility for the deadly pandemic onto anybody or anything but themselves. Various scapegoats have been developed over the last 20 years via the government, scientific community, mainstream media, education system, medical establishment and international politics specifically for the aftermath of a global pandemic. 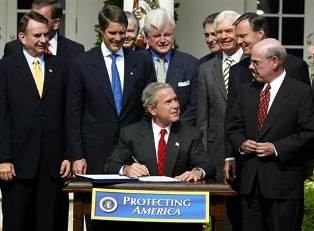 BIO-TERROR LEGISLATION: In the wake of the 9/11 terror attacks, the U.S. government more than any other nation has been systematically preparing its population for an upcoming bio-terror related pandemic. A blatantly hypocritical philosophy has been employed whereby bio-terror legislation is passed in mass, yet many of the ethical and moral restrictions on biological research, vaccine trials and regulations have all but disappeared. 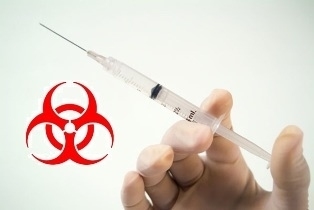 BIO-TERROR CONTRACTS: Bio-terror related contracts made between the U.S. government and private bio-tech companies indicate that anthrax and smallpox vaccines are the main focus and the #1 priority. Privately made smallpox and anthrax vaccines will likely be tainted and could be the root cause of death for millions of people uninformed enough to take the vaccine. By outsourcing the smallpox and anthrax vaccines, the government gains plausible deniability in order to avoid lawsuits in the aftermath of a pandemic. 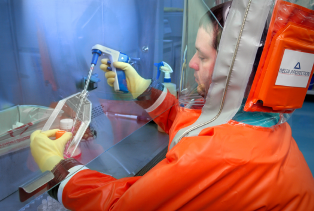 BIO-SAFETY LABS: BSL Labs or biosafety level labs have been built all over the United States and around the world. For strategic purposes, a majority of these BSL labs have been purposely placed in large population centers. Regardless of their rating (1-4), BSL labs are a major health risk to the general public simply based on the fact that they house deadly pathogens and suspicious “accidents” tend to occur at these facilities on a regular basis. Should a bio-terror pandemic arise, it is highly likely that BSL labs will serve as the original source of the deadly pathogen. PAMDEMICS: Based on the ancient and recent history of worldwide pandemics, there will likely be a deadly man-made bio-terror generated pandemic in the very near future. 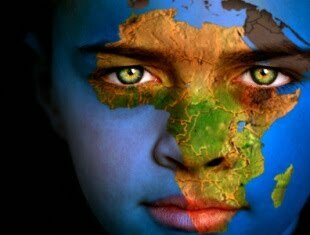 Although North America and Europe have been relatively pandemic free over the last 100 years, the world has suffered unmercifully while millions have been culled by disease in the Third World. Unregulated human “testing” has been carried out by various governmental and non-governmental medical organizations in which vaccines are routinely blamed a the cause of disease outbreaks and subsequent pandemics. Until the vaccine and human medical testing stops, the world will undoubtedly suffer pandemic after pandemic. BIO-TERROR AFTERMATH: In the aftermath of a bio-terror attack and subsequent pandemic, there will be mass confusion, fear, and hysteria. In this chaotic environment, there will be political and governmental agencies and institutions that will attempt to take advantage of the situation. Based on the whitepapers written in respect to bio-terrorism, the U.S. government will declare martial law after a bio-terror generated pandemic is confirmed. When this occurs, radio host Alex Jones will attempt to incite violence by calling for violence against the U.S. military and police forces. Once Jones’ listeners take up arms against the U.S. government, Operation ENDGAME will go into effect. The few weeks after martial law is called will ultimately and forever dictate the future of the United States of America. BIO-TERROR GAMES: There have been 3 board games which have been released in respect to bio-terrorism and pandemics. Eerily, the Illuminati card game predicted the 9/11 attacks (Pentagon & Twin Towers), the Fukushima nuclear disaster and the Gulf Oil Spill. 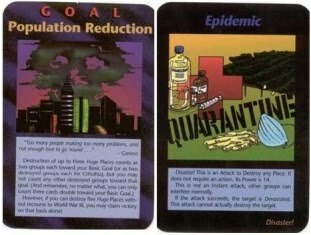 Only time will tell if Illuminati’s Epidemic and Population Reduction cards (see photo) will also transpire in reality. BIO-TERROR MOVIES: Starting in 1957, there have been 19 mainstream movies and documentaries dealing specifically with bio-terror and pandemics. Although these films have been sporadic over the last 55 years, they have intensified over the last 10 and appear to be peaking in 2012 or 2013. 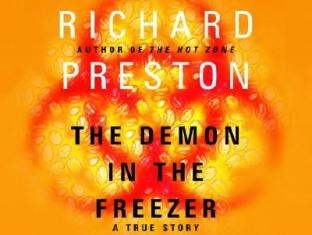 BIO-TERROR BOOKS: Starting in 1939, there have been 21 books, both fiction and non-fiction, dealing with the topics of bio-terror and pandemics. Although these books have been sporadic over the last 50 years, they have intensified over the last 15. Based on the evidence uncovered by the Sunshine Project, it appears that the U.S. is allegedly attempting to piece together the DNA of the "Spanish Flu" while blatantly ignoring the fact that it was vaccines and vaccines alone which killed between 50-130 million people back in 1918. Should a bio-terror attack and subsequent pandemic occur, the "Spanish Flu" will likely be scapegoated as the culprit all thanks to a complicit media and a genocidal bio-weapons program that is clearly out of control. 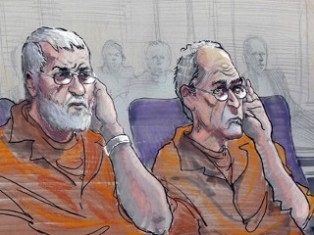 BIO-TERROR SUSPECTS: When a major bio-terror attack and subsequent pandemic hits the United States of America, it will most likely be executed from behind the scenes by Ezekiel Emanuel (pictured right), soon to be known as the “Doctor of Death”. As it currently stands, the city of Chicago is bio-terror target #1 with Ezekiel’s brother Rahm Emanuel (pictured left) in the power position of mayor. Both Emanuel brothers are dual U.S. and Israeli citizens whose father is a known Zionist terrorist. 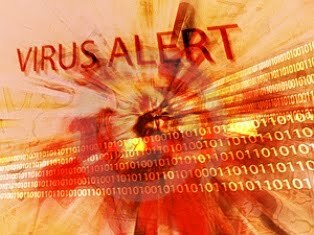 THE BIO-TERROR PSYOP: In December of 2011, a global bio-terror PSYOP (psychological operation), hoax, or false-flag was executed when it was revealed that a mutated airborne form of the H5N1 strain of avian influenza was created by a Dutch team of scientists led by Ron Fouchier, of Rotterdam's Erasmus Medical Centre. This major discovery was fabricated in a calculated attempt by the modern medical establishment to deceive the world that into believing that humanity is on the precipice of a genetically mutated pandemic. After the story made international headlines and a 60 day moratorium on flu research was called, the claim of the new deadly air-borne pathogens was all but debunked by medical researchers in Wisconsin. 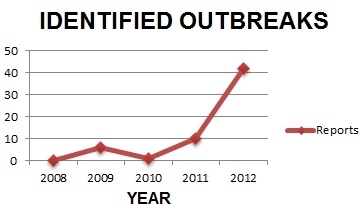 IDENTIFIED BIO-OUTBREAKS: Biological outbreaks worldwide have skyrocketed since 2011. While some reports may have been legitimate outbreaks, most if not all appear to be generated man-made outbreaks with the overall goal of convincing America and the world that it is on the precipice of a major pandemic. BIO-TERROR LOCATIONS: Although a bio-terror attack and subsequent pandemic could theoretically occur in any city or region, there are two specific locations which have drawn red flags due to their recent bio-terror related incidents and the global events that will occur there in 2012, namely Chicago, Illinois and London, England. Other potential bio-terror locations include Atlanta, Georgia, Boston, Massachusetts, Cruise Ships, Disney (California & Florida), India, Islands, Mall of America (Minnesota), New York City (Subway) and the San Francisco (Airport). 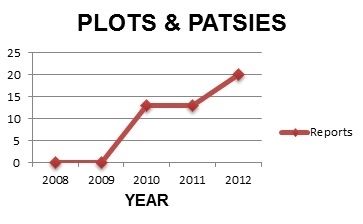 BIO-TERROR PLOTS & PATSIES: Since 2010, a number of bio-terror plots have allegedly been subverted and numerous individuals have been arrested for biological and chemical related crimes. Despite the growing number of high-profile bio-terror plots and patsies, the historical record indicates that 99% of all bio-terror plots, attacks, “tests”, “accidents” and drills are conducted by the government who has the means, the motive and the opportunity for a bio-terror attack. BIO-TERROR CAUSES: If and when a full-scale bio-terror attack occurs, the live pathogens or agents responsible for the pandemic will likely be dispersed via chemtrails by government airplanes or drones, by the U.S. 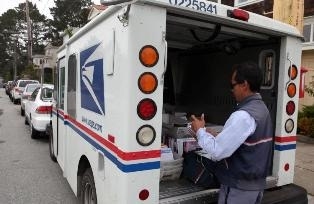 Postal Service via Tide detergent samples, by the government and medical establishment via tainted vaccines, or by clinics via the portable petri dish commonly known as a Trojan condom. Although the aforementioned causes are all a possibility, it most likely that tainted vaccines will be the root cause of millions of deaths. BIO-TERROR DATES: Due to the relatively slow moving nature of a biological disease, it is impossible to know the exact date at which a natural occurring outbreak will occur. 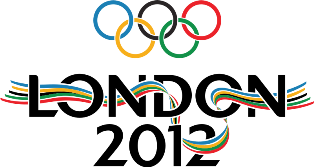 However, should a pandemic start as a result of a man made bio-terror event, the dates of May 20-21, 2012 (NATO Summit in Chicago) and July 27-August 12, 2012 (Summer Olympics in London) appear to be the dates at which it is most likely that a bio-terror attack will transpire. Other potential dates include the Democratic National Convention in Charlotte, North Carolina on September 6, 2012, the 11th anniversary of the 9/11 attacks on September 11, 2012, and April 19, 2013, the most infamous date in American history. 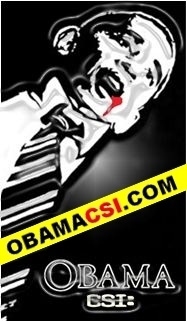 BIO-TERROR SCARES: Since the election of Barack H. Obama in 2008, there have been over 50 bio-terror scares in America. A bio-terror scare is essentially a live bio-terror drill except that the public and most of the authorities are unaware that there is no real bio-terror danger. Generally, once the incident is over, the news is broken hat there was no real threat and that it was an accident, misunderstanding, or simple mistake that led to the bio-terror emergency. Bio-terror “scares” enable authorities to gage real time reactions to bio-terror and allow for better understanding of how the public, law enforcement and first responders will react in a real bio-terror emergency. 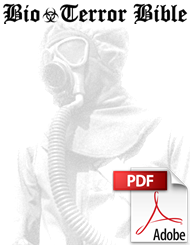 BIO-TERROR TREATIES: Israel is the only modern nation that has not signed the 1972 Biological Weapons Convention, the refusal to engage in offensive biological warfare, stockpiling, and use of biological weapons. Israel is also the only modern nation that has signed but not ratified the 1993 Chemical Weapons Convention, refusal to produce, stockpile and use chemical weapons. 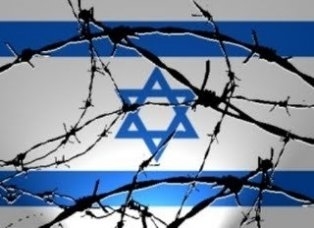 Should a future biological terror attack hit America or any other nation, the state of Israel and its citizens holding dual passports will be prime suspects. 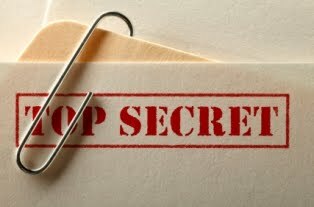 BIO-TERROR SECRECY & VIOLATIONS: Secrecy and ethical violations in respect to bio-terror research are numerous and shocking. Repeated warnings, citations and fines are all but ignored by governments and corporations rendering the climate surrounding offensive bio-weapons research programs as highly volatile and dangerous. 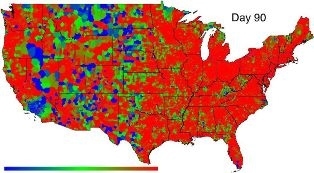 To date, the United States is by far the most egregious offender and will likely be scapegoated in the aftermath of the pandemic by the infamous Sunshine Project. SUNSHINE PROJECT: The Sunshine Project was a foundation funded program that existed in Europe and the United States from 2000 until 2008. 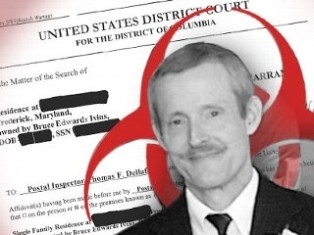 While its purpose was never clearly defined, it acted as a source of information in respect to the highly illegal and highly unethical scientific practices occurring in the field of microbiology, specifically in bio-terror and bio-weapons research. The Sunshine Project will likely be trotted out in the media post pandemic to shine light on (demonize and blame) the United States for ultimately allowing an environment of underground bio-related research to flourish. 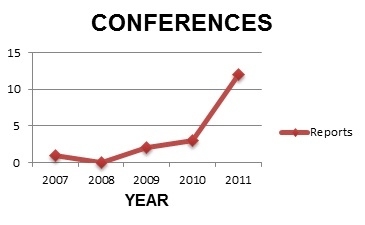 BIO-TERROR CONFERENCES: Bio-terror and pandemic related conferences have occurred on a regular basis since 9/11, but have recently started occurring on a monthly basis since March of 2011. 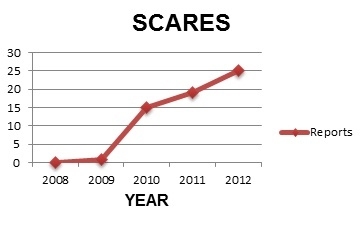 In 2012 alone there have already been 8 announced bio-terror summits and conferences. 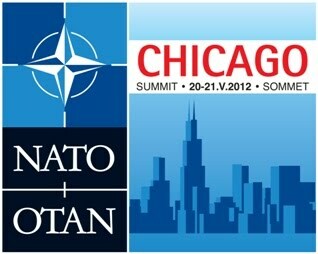 Coincidentally, the WHO Summit will start on May 22, 2012), the day after the NATO Summit in Chicago. BIO-LAB ACCIDENTS: Totally inexcusable and unlikely lab “accidents” have been occurring recently at BSL Labs (biosafety level labs) within the United States and around the world. It appears that a majority of these “accidents” were done on purpose with the overall goal of convincing the medical community and the public that a lab “accident” could in fact lead to a global pandemic. Should a bio-terror pandemic arise, it is possible that a lab “accident” may serve as the scapegoat and source of the deadly pathogen. VACCINES: A wealth of recent medical research indicates that vaccines are no longer safe and may cause serious neurological problems, seizures, autism and even death. A recent push by the medical and government establishment in America to make vaccines mandatory may go into effect during a pandemic in which martial military law will be called and personal freedoms like the right to refuse a vaccine will be denied. In a major bio-terror related pandemic, it will be the tainted vaccines which are ultimately responsible for killing 99% of the victims. 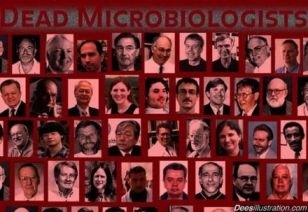 ROGUE SCIENTISTS: Since the 9/11 terror attacks, there have been at least 4 government microbiologists that have been exposed for allegedly acting in a rogue manner in respect to bio-terrorism. Although on the surface it appears that these scientists acted alone, the truth is certainly a different story. Aside from having the means, the motive and the opportunity to conduct a major bio-terror attack, the government through its university system has an unlimited supply of willing, able and blackmailable scientists to choose from. 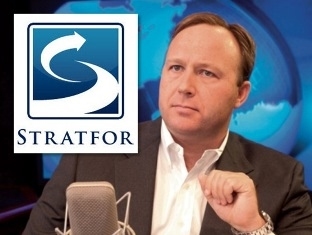 In order to organize, plan, drill and execute a major bio-terror false-flag operation, millions if not hundreds of millions of dollars are needed in order to blackmail scientists, steal or develop the virus or agent, weaponize it, deliver it, and execute the operation without getting arrested or properly investigated. The sheer logistics, security, communication and cover-up needed before and after the bio-terror attack is so daunting, there is only one suspect (government) even capable of carrying it out. GOVERNMENT BIO-TERROR ATTACKS & TESTS: The historical record of government sponsored bio-terror is littered with unprovoked attacks on unsuspecting soldiers and citizens alike. The fact that state sponsored bio-terror tests/attacks exist in mass confirms not only that government is a serial bio-terrorist killer, but that they will strike again in the near future. 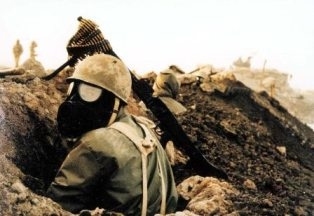 Currently, Israel is the only modern nation that has not signed the 1972 Biological Weapons Convention, refusal to engage in offensive biological warfare, stockpiling, and use of biological weapons. Also, Israel is the only modern nation that has signed but not ratified the 1993 Chemical Weapons Convention, refusal to produce, stockpile and use chemical weapons). BIO-TERROR TECHNOLOGY: In 2011, a Facebook application was developed in a lab at Israel's Tel Aviv University which simulates the spread of a virus allegedly to indicate how infections spread among populations. 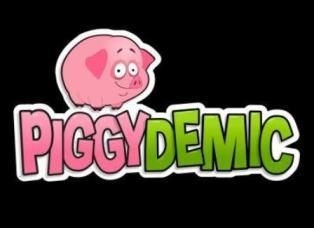 The Facebook application is called PiggyDemic, and it allows users to "infect" their friends with a simulated virus or become infected themselves. Aside from this racist and disturbing application, a pandemic blog, multiple bio-terror sniffing phone applications, and a bio-terror first responder iPhone application have all recently been invented. All that is now missing from the technological pandemic equation is the made for TV bio-terror attack. BIO-TERROR REALITY: The true reality of the bio-terror and pandemic situation is almost 100% opposite of what the public has been led to believe. For example, smallpox is ONLY contagious through direct contact, yet the media propaganda will insist that an airline passenger infected with smallpox can infect thousands of people in different countries within a few hours. Overwhelming evidence shows that vaccines almost always to more harm than good and new evidence even suggests that the human body is not in need of any help when fighting off disease. Aside from the scientific aspects, the historical record shows that governments of all sorts are complicit in the funding, planning, drilling and war-gaming a future bio-terror generated pandemic. 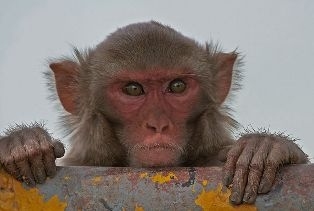 The mass killing of millions is on the political agenda and only an informed population can expose and stop it. BIO-TERROR VIDEOS: The video library of The Bio-Terror Bible houses 14 videos that deal specifically with topics of bio-terror and pandemics. Shocking videos of bio-terror war-games, bio-terror drills, bio-terror conferences, bio-terror propaganda, medical martial law and dire warnings of doom gives the viewer an inside look into the upcoming bio-terror generated pandemic. CHICAGO: The city of Chicago has a rich history of bio-terror related incidents and was recently depicted in the bio-terror propaganda film entitled Contagion as the first American city hit with an outbreak in a fictitious global pandemic that kills millions. The city of Chicago is also one of 21 cities NOT at risk for elimination from the Cities Readiness Initiative, meaning that Chicago is "ready" for bio-terrorism.